If you work in the forestry industry your need for public liability insurance is often greater than most. 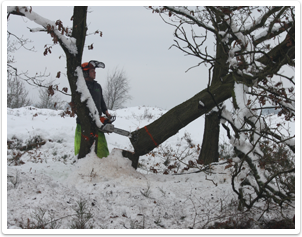 Whether you work on the ground, use a harvester or forwarder, we offer products with benefits including no height restrictions, no depth limits, up to £5m professional indemnity cover if you or an employee were to cut down the wrong tree, or a tree protected by a tree preservation order. If you're an employer, Employer's liability insurance will enable you to meet the cost of compensation for any injuries or illness caused to your employees. You can be fined if do not hold a current employer's liability insurance policy which complies with the law. To find out more about the act please click here. You can add £10milllion employer's liability insurance that also includes rehabilitation cover - designed to get your employees back to work sooner. For an forestry insurance, arboriculture or tree surgery quote please call us now or click for a quote.